TomTom Via LIVE 120 is pre-installed with mapping for UK and Ireland. Enjoy ultra intuitive design with a responsive, rich colour Fluid 4.3-inch touchscreen. TomTom Via LIVE 120 includes a FREE 1 year subscription to LIVE services, for the best mobile speed cameras and traffic information. TomTom Via LIVE 120 also includes speech recognition technology enabling you to enter your destination by simply announcing the address, Bluetooth hands-free calling, Advanced Lane Assistance, IQ Routes, Eco Routes and the latest maps guarantee within 90 days of first use. TomTom Via LIVE 120 has been discontinued. TomTom Via LIVE 120 sat nav device comes with the latest and most complete maps of United Kingdom and Republic of Ireland. The large high-quality 4.3-inch fluid touchscreen and latest version of TomTom's award-winning, user-friendly software enables you to plan your route to fit your requirements, such as: quickest, shortest, avoiding toll roads and congestion charge areas, by required arrival time, etc. The TomTom Via LIVE tells you exactly what’s up ahead so you can sit back and enjoy the ride. Let HD Traffic guide you through jams and leave traffic behind. Get speed camera warnings, information via Local Search with Google and weather reports. Designed for convenience, you can also use your voice for many different tasks, such as entering addresses and making calls hands-free. Drive LIVE across more than 30+ European countries*. In addition to the best, real-time traffic updates, you know where the mobile Speed Cameras are, you can find any locations via Local Search with Google and more. And it’s all free for a year. *services may vary. Get accurate traffic info updated every two minutes – that's at least seven times more frequently than any other provider. Steer clear of delays, and know exactly when you're due to arrive. Plus, drive stress-free wherever you go, with detailed coverage across Europe. The TomTom Via LIVE 120 receives real-time mobile Speed camera locations, including reports from other users. It also warns you of other alerts, such as fixed safety cameras and average speed checks for the road ahead. It helps you drive safely and relaxed, saving money on speeding fines. You are ready to go with the most intelligent maps. IQ Routes speed profiles give you the fastest route any time of day. And with rich POI data, such as phone numbers and opening times, you have even more information at your fingertips. Tap into the latest local Google listings from your TomTom Via LIVE 120 to locate anything from Indian restaurants to flower shops wherever you are. Type in any search word, find matching locations and let your device take you there. Helping you to keep your eyes on the road, spoken instructions now include street names, to make turnings even clearer. Start driving with the latest map - guaranteed! If a new map for your TomTom Via LIVE 120 is available within 90 days of first use, you can download that map once for free via tomtom.com, please note you are only entitled to one free map download. Due to the continuous improvements in our map quality, some new maps may not fit on your device. In these cases, detailed Map Zones are offered for download. You can only use one Map Zone on your device at a time but it's easy and free to change to another zone at any time using tomtom.com. For more information check www.tomtom.com/mapzones. Only TomTom uses actual speed data collected from millions of users to calculate the fastest routes at any point in time. Imagine a route that takes into account rush hour, traffic lights, zebra crossings, school exits or even shopping crowds, every minute of every day. That's how smart IQ Routes is! No more waiting around - your route is calculated in a matter of seconds, so you get on your way much faster than ever before. Driving with these more fuel-efficient routes saves you money as well as reducing your impact on the environment. The TomTom Via LIVE 120 can show you the route which has a lower environmental impact, using the driving data of millions of TomTom users. Use your TomTom Via LIVE 120 as an car-kit for your mobile phone. Now you can make and answer phone calls safely while driving, making you in control and in touch. Pinch to zoom in and out of maps, or scroll through menus with the tip of your finger – the TomTom Via LIVE 120 screen responds intelligently and sensitively to your touch. Advanced speech recognition technology lets you control your TomTom Via LIVE 120 using voice commands. From planning a route to making a call, over 150 tasks are easily activated by voice, making your drive smoother and safer. TomTom Via LIVE 120 get's it speed camera data from Road Angel a leading UK speed camera detector manufacturer. The Via 135 sat nav also alerts you when you’re speeding, even if you're not in navigation mode. TomTom Via LIVE 120 has been designed to be a portable plug and play device, and as such can be transferred from vehicle to vehicle with ease by the user. TomTom Via LIVE 120 is powered with a 12-volt Compact Car Charger (supplied) and attaches to your vehicles windscreen via the TomTom Via LIVE 120 Easy Click Mount which is also included. 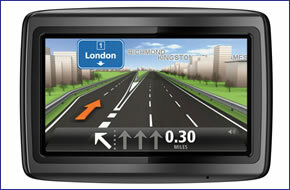 The TomTom Via LIVE 120 sat nav comes with the latest and most complete maps of UK and Ireland. Door-to-door accurate navigation anywhere across the continent. Which in addition to street information include features such as route calculation, Points of Interest, Estimated Time of Arrival, and TomTom Map Share technology. TomTom’s unique Map Share technology enhances your navigation experience, because you can now make instant changes directly on your map. TomTom Map Share technology allows you to make corrections to your own map and benefit from thousands of corrections made by TomTom users every day - free of charge. Detailed map coverage of England, Wales, Scotland, the Republic of Ireland and Northern Ireland. Partial coverage of the Channel Islands. Partial map coverage: Bulgaria, Croatia, Latvia, Romania, Turkey, Ukraine, Russian Federation. Connecting Roads: Albania, Belarus, Bosnia-Herzegovina, Macedonia, Moldavia, Montenegro, Serbia.